Apple Music and Spotify are the biggest players in the music streaming space -- and for good reason. 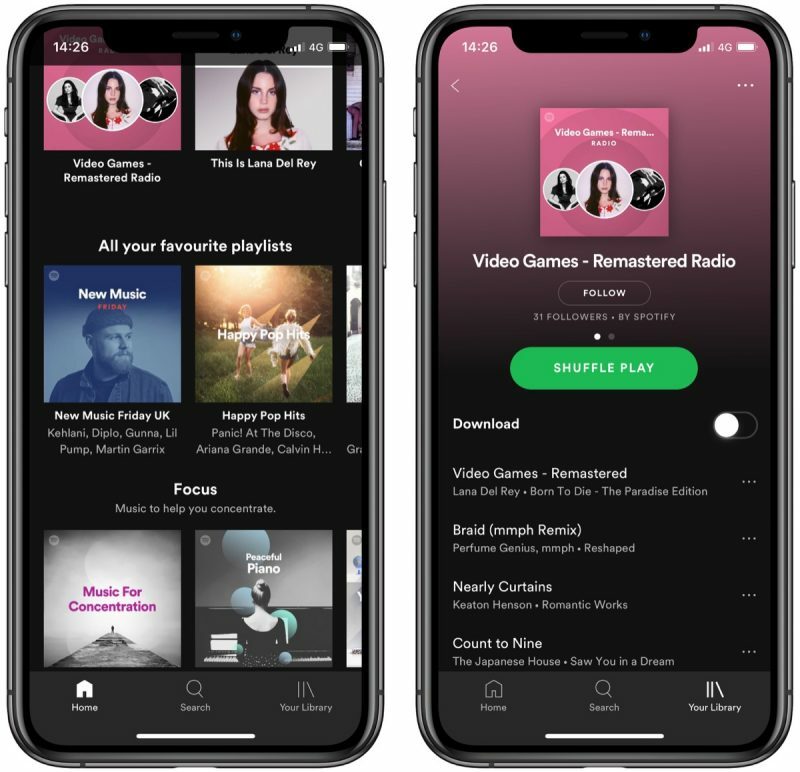 Spotify essentially created the market as it exists today and has millions more users globally than any other service, but Apple Music is catching up, thanks to its deep integration in Apple's popular iOS ecosystem. Both Spotify and Apple Music offer as much music and related content as your ears could handle – including exclusive new releases from top artists – and all of it can be streamed ad-free (with Spotify's paid tier) or downloaded for offline play. So which is the best option for you? Keep reading as we pit the two services against each other. 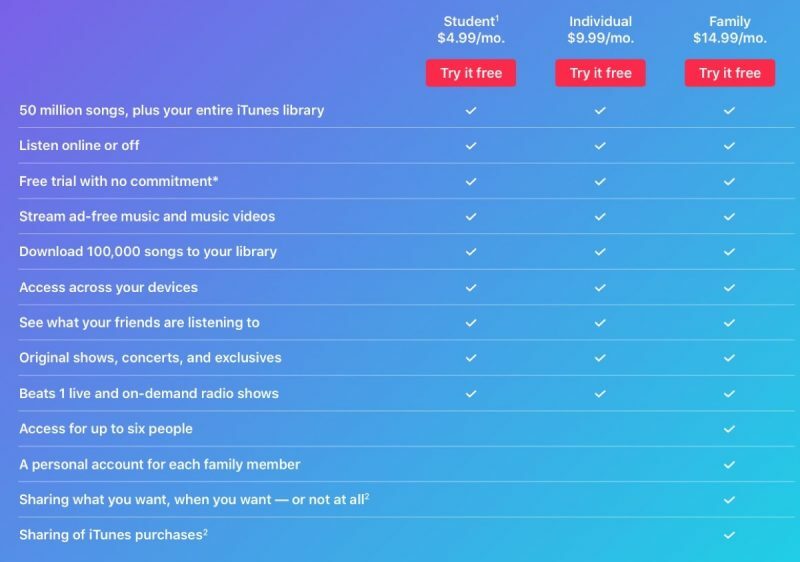 An individual Apple Music subscription costs $9.99 per month in the United States, with slight price variations in other countries and territories. Likewise, an individual Spotify subscription or "Premium" plan costs $9.99 per month, with some regional variations. 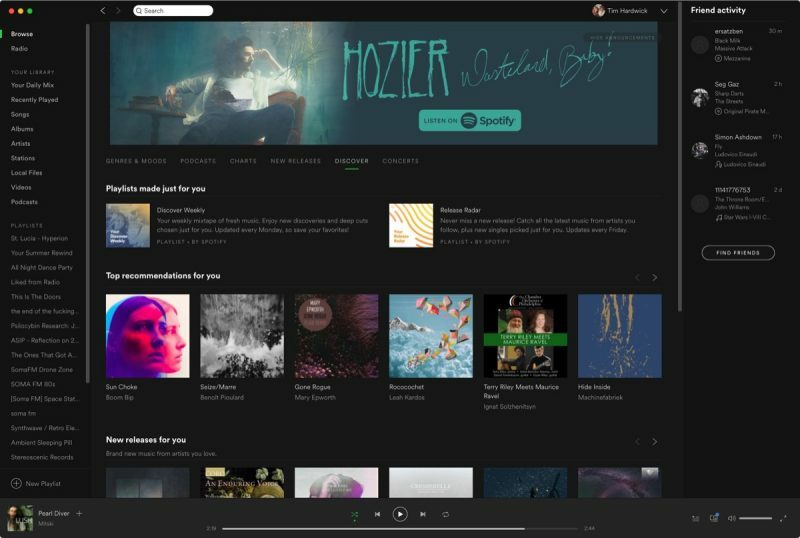 In addition to its paid plan, Spotify also offers a free ad-supported service that allows users to shuffle-play songs, although premium features remain off limits. Both services offer student and family plans for $4.99 per month and $14.99 per month, respectively. Spotify's student offering currently includes additional access to an ad-supported Hulu TV plan and unlimited access to the SHOWTIME streaming service. Apple Music and Spotify family plans meanwhile are very similar. Up to six people can access the services using a personal account for each family member, with the exception that Apple Music members can also share iTunes purchases in addition to catalog content. Apple Music does, however, require all family members to use the same credit card for App Store purchases. 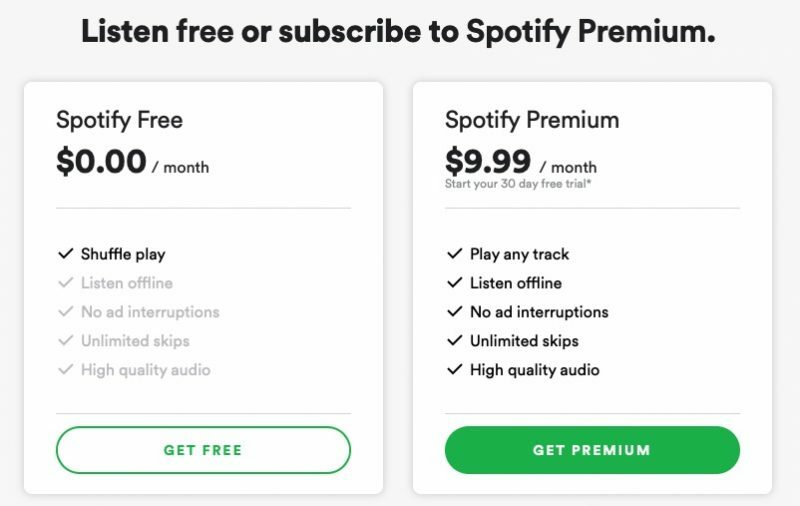 Spotify also offers a free trial of its Premium plan, but it only lasts for 30 days before billing begins, although you do have the option to use the free plan for as long as you want if you need more time to make up your mind about the service. All paid Apple Music and Spotify plans give you access to a huge catalog of songs when you sign up. Apple Music boasts 50 million songs in its catalog, while Spotify subscribers have the pick of "over 35 million" songs, so regardless of which one has the most content, both allow you to build up a large collection of music. However when it comes to offline listening, there are limits. Apple Music users can download a maximum of 100,000 songs to their library, and using Apple's iCloud Music Library feature these can be synced across devices signed into the same Apple ID. Spotify Premium members can download up to 10,000 songs on each of up to 5 different devices, but this number doesn't include saved playlists. Offline listening on the services covers songs, video content, concerts and artist exclusives. In addition, Spotify subscribers have access to audiobooks and podcasts, and the company is known to be investing heavily in its podcasts offering, so users can expect a lot more content in this department soon. Apple Music streams 256kbps AAC files, while Spotify uses the Ogg Vorbis format and lets you choose the bitrate depending on how you're listening. On mobile you can elect to stream in Low (24 kbit/s), Normal (96 kbit/s), High (160 kbit/s) or Very High (320 kbit/s) quality. Apart from audiophiles, most listeners probably won't notice much difference between the highest-quality Spotify and Apple Music streams of the same song, but Spotify's ability to select the bitrate can come in handy if you're worried about using up your cellular data. The Apple Music catalog is accessed within the Music app, which has a clean white interface and comes pre-installed on every iPhone, iPad and iPod touch, and is available as a separate downloadable app on Android devices. Spotify's apps have a contrasting uniform black interface and are also available on both iOS and Android. 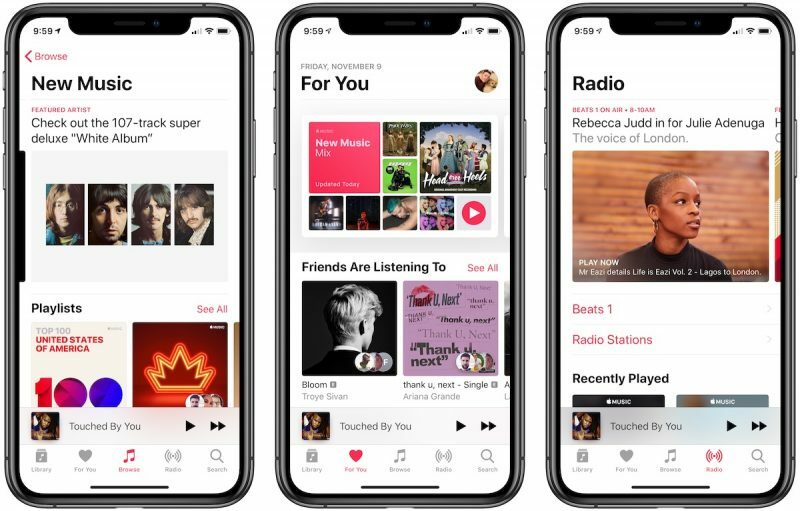 The Apple Music mobile app is organized into tabs to access your music library, browse the Apple Music catalog, and listen to radio stations, while a "For You" tab lets you check out suggestions based on your listening preferences. The Spotify mobile app has a similar tabbed format, giving you access to listening recommendations, a catalog search function, and your library. Both apps are easy to navigate and include fullscreen media players that showcase album art as you listen. These screens also put add-to-playlist, sharing, song queuing, and audio device options at your fingertips, with Apple Music having the advantage of 3D Touch support on compatible devices, allowing you to quickly access additional menus. Unlike Apple's Music app, one notable limitation of the Spotify app for iOS is that you can't merge local music stored on your device with your Spotify library -- you have to use the Local files feature in the desktop app to sync them across from your computer, and unfortunately it doesn't work as well as Apple's iCloud Music Library feature. On desktop, Apple Music subscribers can access the service through the iTunes app for Mac and PC. Apple Music in iTunes is largely based on the same format as the mobile app, but it's not quite as pretty. It's also a little less navigable, but it does have one trick up its sleeve: Smart Playlists. These can be automatically generated by iTunes based on genre, date added, loved/disliked, and so on, meaning you don't have to manually build playlists yourself if you don't want to. Spotify also offers apps for Mac and PC. They recreate the mobile interface for desktop well, and are slimmer and easier to navigate than iTunes, which feels bloated in comparison. In addition, Spotify offers a handy web player for accessing the service from any web browser, which is convenient if you want to access the service on a computer that doesn't have the Spotify app installed (your office PC, for example). Apple Music still lacks an equivalent, but subscribers can use a free third-party web player called Musish, although it's currently in development and still missing a few features. Comparatively, Spotify's Home screen is where the service's personalization is centered. Discover Weekly is added every Monday morning, and delivers a two-hour playlist of personalized music recommendations based on your listening habits, as well as the habits of other users who listen to similar artists. Meanwhile, Daily Mixes playlists feature tracks and artists in a certain genre that you've been listening to, plus a few additional recommendations, while Release Radar is a playlist of new releases recommended just for you. While Spotify's Home screen also features new releases and "Made for Everyone" playlists categorized into genres and moods, Apple Music's non-personalized content lives in a separate Browse tab showcasing trending artists and playlists, top charts, and music videos. Browse is also home to a TV and films section that features Apple-made programming like "Carpool Karaoke" and artist documentaries. Spotify doesn't really have an equivalent, although when you create a station from a song, album, artist, or playlist, Spotify Radio creates picks the music for you, and while Apple Music has the same feature, Spotify's suggestion algorithm is generally much better. On the flip side, Apple Music's Search tab includes the option to search the Apple Music catalog using a lyric phrase, which is really handy when you don't know or can't remember the name of a song. Both services allow you to follow friends who are also subscribers and share playlists with them that you've personally created. Spotify and Apple Music also let you share song links via text or over social media. In the Spotify desktop app you can see what song your friends are currently listening to, provided they choose to share this information. Similarly, Apple Music's For You tab shows what your friends are listening to if you've connected to them. As an Apple Music subscriber, you can use Siri as a personal DJ to control song playback, queue up songs, find song facts, add songs to your library, play your favorite playlists, or even play something new. This is a big advantage Apple Music has over Spotify, which requires a more complicated solution using Siri Shortcuts to get Siri to play nice with the Spotify app, and even then it lacks many equivalent features. 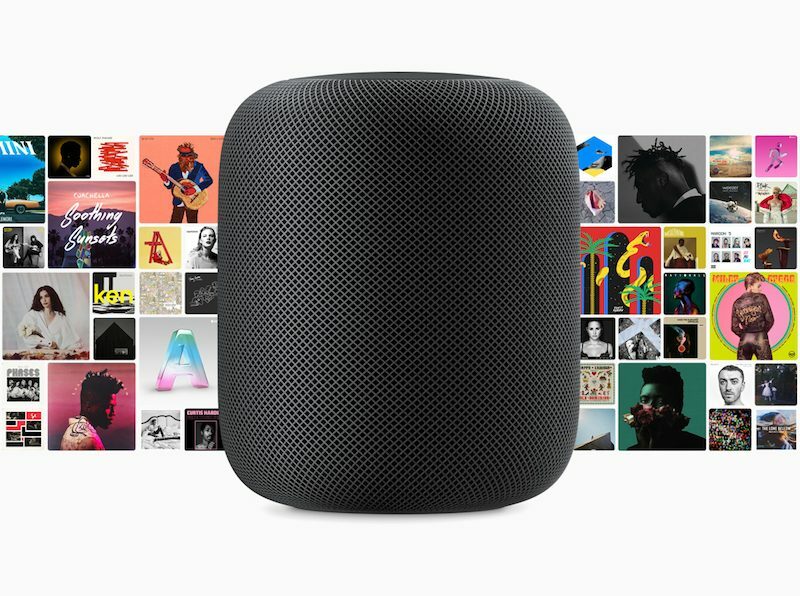 Apple's HomePod speaker is essentially made to be used in conjunction with Apple Music. In fact, one of the main reasons for Siri on HomePod is to control your Apple Music collection. There are Siri voice commands for accessing content like playlists, genres, moods, liking or disliking songs, playing more music based on something you've heard, starting a new radio station, and much more. None of these functions will work with a Spotify subscription -- you can stream audio to HomePod from a device running the Spotify app, but that's it. On the plus side, Spotify supports lots of different third-party devices, from game consoles to smart speakers. And if you own an Amazon Alexa-enabled speaker you can link it to both Apple Music and Spotify, but check your region first as support can vary depending on where you live. Apple's CarPlay system supports Spotify and, of course, Apple Music. If a car doesn't have CarPlay, most newer models have their own entertainment systems, which often make it easy to connect your chosen streaming service. Usually you can do so either direct from a built-in app, over Bluetooth, or via a cable connection. If you're just looking for a free music streaming service and you don't mind ads, Spotify is the obvious choice. However if you're willing to pay, choosing between Apple Music and Spotify gets tricky. If you're already invested in the Apple ecosystem (perhaps you own an Apple TV or a HomePod as well as an iPhone) then the decision should be easier, given Apple Music's hardware integration and its ability to import your existing iTunes music library. But if these aren't considerations, Spotify is certainly a strong alternative, thanks to its excellent music discovery and personalization features. I tried Apple Music a couple of times, but it doesn't even come close to Spotify in my opinion. Spotify has far better-curated playlists. They are great at finding music I prefer. I usually listen to a ton of Indie. Too much corporate stuff pushed by Apple Music and all the "New" stuff they display are same old stuff. When I go to Spotify my "Discover Weekly" playlist is filled with good stuff and hidden gems. I have yet to see Apple make a decent playlist towards my tastes. Apple's big advantage could have been Beats One, an international live radio station with a truly massive built in audience. Unfortunately they squandered their big opportunity by playing nothing but rap (which is not music) and bizarre euroelectronica music. What a shame. I hope you can dodge all those stones coming your way. The truth is my shield. 2) Hip hop IS global pop culture at the moment. No other music genre has the same wide appeal, popularity, and global reach. Regardless of the country you’re in, hip hop is the cultural currency of the day. Also, it’s fine if you don’t like hip hop, but calling it “not music” is pretty offensive. I vastly prefer Spotifys UX. Apple Music is very, very good. But its music discovery isn’t nearly as good as Spotify’s. Spotify’s algorithm is both very accurate to my listening habits and at times surprising in a great way. Apple Music, on the other hand, feels very rigid and pushes a ton of pre-made playlists. Not surprising since Apple is terrible at using and parsing data of any kind. But I love the curated shows by artists. Alligator Hour in particular is amazing. There’s just nothing like that on Spotify. I’ve had both and I found Spotify to be superior in its recommendations. I do wish I could upload my own songs that are not on Spotify and I own. But the absolute main reason Spotify wins over Apple Music is that I can download the app to much older OS. I have the app on my snow leopard mechine at work. That plus the web player which is a god send. 1. The algorithm for stations and recommendations does not seem to be very intelligent. In fact, it is pretty rigid and stupid. And it continues to play songs that you have disliked. 2. I want to be able to block specific artists, albums, songs, etc. Apple Music keeps making me listen to "Home" by Phillip Phillips. I have already disliked it and I skip it every time, but it keeps shoving it in my face. There will be no stones coming his way. Most of us recognize that comment for the inanity that it is and we bypassed it entirely. On topic: I use neither but if I had to choose, I'd go with Spotify. The web player would put me over the edge.